Welcome to the Central Virginia AFP Chapter! Why do we do what we do as fundraising professionals? Because our work matters. Because we believe in philanthropy. Because we want to change the world. Because we are inspired. I’m inspired – by each of you, by the 2019 chapter board, and most of all by the incredible good that we accomplish as a collective group in Central Virginia. As I think about what AFP means to me, inspiration is a huge part of it. However, friends, our work is not without challenge. But, with each of you as colleagues in our hard work, the challenges become surmountable, and I know that our Central Virginia region is a better place. The support network built within AFP Central Virginia is another huge part of why I got involved. So – thank you for visiting the AFP Central Virginia website – take a look around – engage in programming, all that the chapter has to offer (particularly to members), and the resources that are available because we are part of an international group. If you haven’t considered joining AFP, please do; we are a group of promise and we want you as a member of the team. If you have any questions, please reach out to me or Ashley Landes, our chapter administrator. Applications now open for the Inclusive Giving Fellowship! 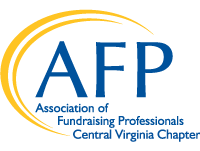 The AFP Inclusive Giving Fellowship offers inclusion-oriented education, training and networking activities, and one-on-one mentorship for Central Virginia-based mid-level and emerging non-profit professionals representing a wide range of diverse backgrounds and interests. This program is being offered free to our community thanks to support by The Monument Group and is open to AFP members and non-AFP members. If you are interested in learning more, please join us on April 23, at 4:30pm at Panera Carytown. Applications are due May 31. Click the link for more information and for the application. The AFP Central Virginia Chapter Board of Directors is proud to announce that it has adopted an I.D.E.A. Resolution and Definitions as part of its commitment to promote diversity and inclusion in our community and our profession. Visit the Library section of our website to read the resolution and definitions.